Tear the rolls into large pieces and soak in the milk for about 10 minutes. In the meantime, place the crusts into a food processor or blender and pulverize. 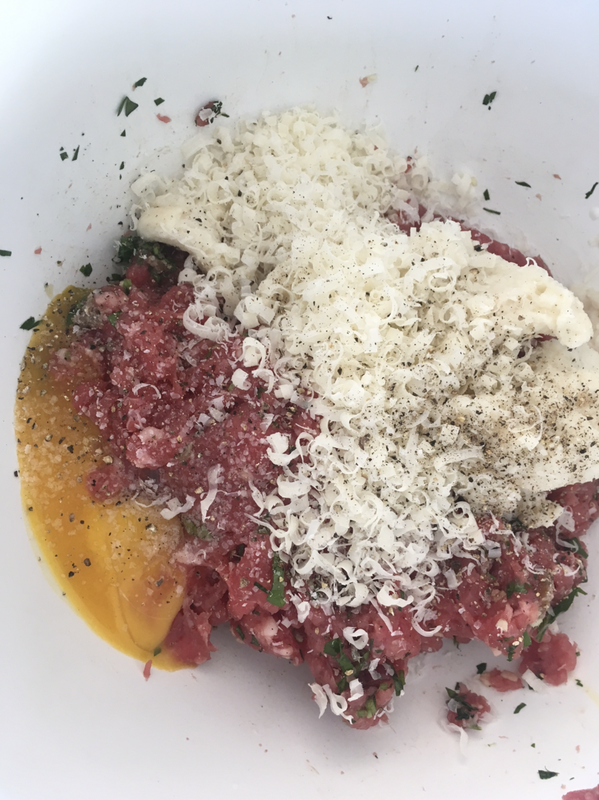 Combine parsley, garlic, fish sauce, egg yolk, and beef. Squeeze out the milk from the bread; discard the milk and add the bread to the mixture. Add salt and pepper and fry up a large pinch to test for seasoning. Roll the meatballs in the bread crumbs. Add the meatballs and cook over high heat for 1 minute on each side to brown. Reduce heat, cover and cook gently for about 10 minutes. Best with cooked spinach or Swiss chard with butter and salt.